Square Enix surprised many people by debuting a new Kingdom Hearts III trailer during Sunday's Xbox E3 Briefing, but more surprising are some of the events in this trailer. Shacknews breaks down some of the key points. Following Saturday's slight 2019 delay, it was expected that Kingdom Hearts III would pop up again at some point during E3 2018, likely during Monday's Square Enix E3 Showcase. Then Square Enix threw everyone a curveball by debuting a new trailer during Sunday's Xbox E3 Briefing. Now that the initial shock of the trailer and its contents have set in, it's time to break down everything that popped up. There's a lot to take away for long-time fans of the series, so let's take a look at four of the most significant items from this latest trailer. The biggest centerpiece is the new Frozen world, taking Sora and his crew to the outskirts of Arendelle. Those who have seen Disney's breakout hit are familiar with the movie's narrative. Elsa grows up with ice powers that she's unable to control. Afraid she'll hurt people with her power, Elsa exiles herself from her own kingdom, leading to her sister Anna trying to bring her home. Kingdom Hearts looks to set itself in the middle of these events, but there seems to be an important twist here. The freshly-reformed Organization XIII is looking to recruit Elsa to their side, seeing the potential power she has. One member is giving her an extra close look and she should be familiar to long-time fans of the KH series. Hey, Larxene is back! 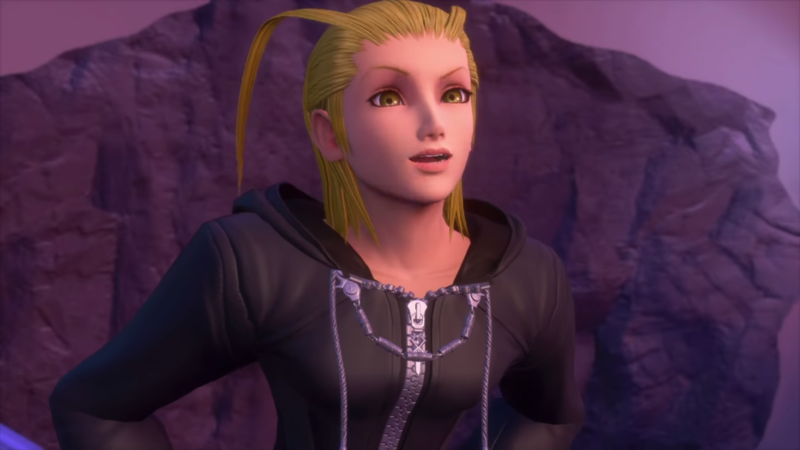 For those unfamiliar with Larxene, she was one of the members of Organization XIII who conspired with Marluxia to take over the group in Kingdom Hearts: Chain of Memories. She fell against Sora in battle, but like Marluxia, she apparently got better. Add her to the growing list of resurrected villains. This seems to point to a rematch with Larxene, but the question will be whether Elsa lends her assistance. 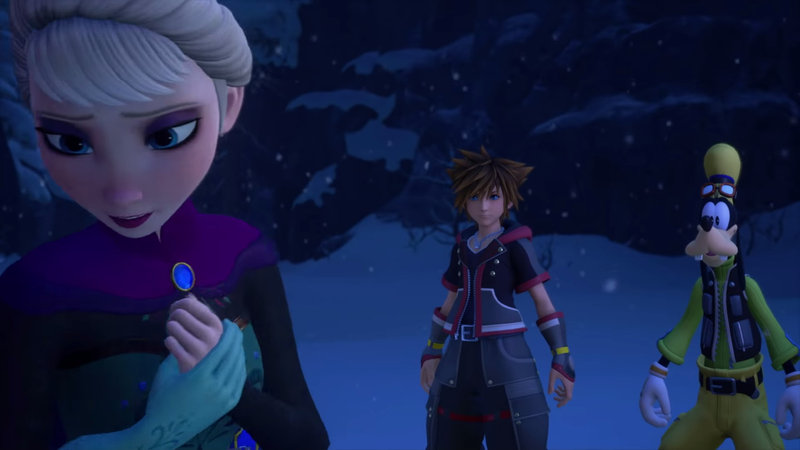 Notice that at no point in the trailer does Sora get any of the Frozen cast as an ally. Does this point to a potential conflict with Elsa? Is there any chance she falls to the darkness within her? This seems to be a lingering plot thread that's carried across multiple trailers. During last year's E3 trailer, Sora confronted Ansem and Xemnas, the central villains of the first two games and two more resurrected villains. 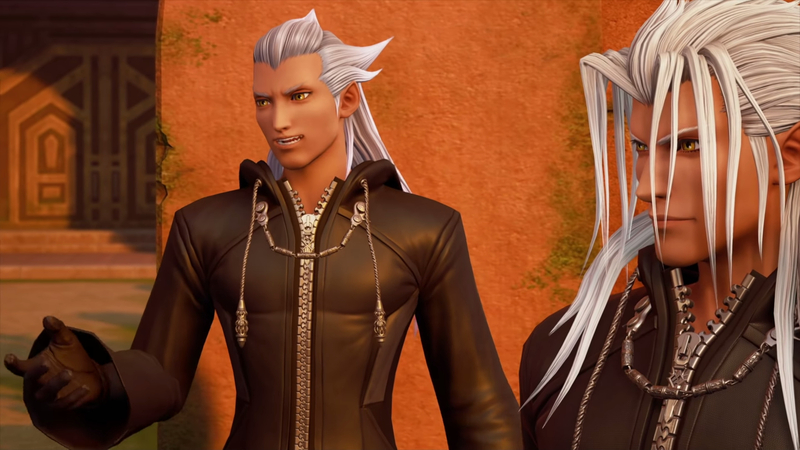 In that trailer, Xemnas teased that it was possible for Sora to bring Roxas back, but he would have to tap into the darkness. Here, that conversation is revisited, with Sora trying to point out that Roxas is in his heart. This dates back to their confrontation in Kingdom Hearts Re:coded, the 2008 Nintendo DS game. Ansem counters this by pointing out that everything Sora saw in Re:coded was just made of data and, therefore, not real. He's technically not wrong, which begs the question of whether Roxas' presence truly is in Sora's heart. Combine all this with Sora's confrontation with Venitas from the D23 Expo Japan trailer and it raises the question of how all of this is connected. There's some mysterious connection between Sora, Roxas, and Ventus that's going to play into the larger story by the end. Do they all end up being a single heart when all of this is over? Do all of them unite together seperately or apart? It's a loaded mystery and one where only more questions are going to be raised before KH3's release date. It wouldn't be a proper, numbered Kingdom Hearts game without the Gummi Ship. Depending on who gets asked, it's either a fun series of side missions or a jarring distraction from the core action-adventure gameplay. 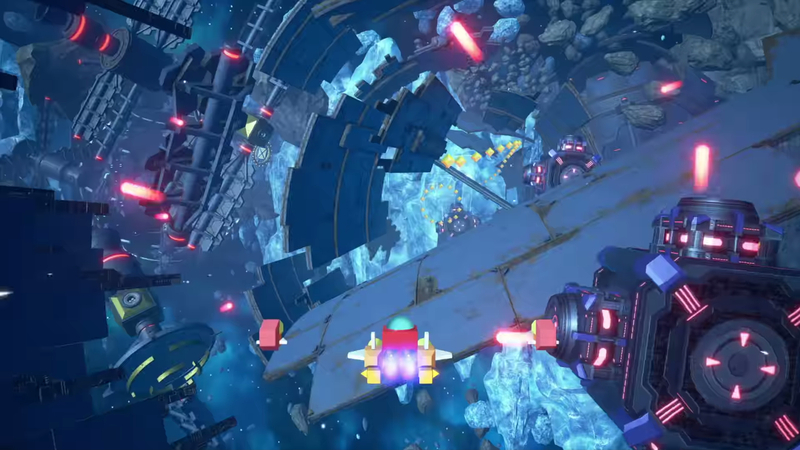 Sunday's trailer saw the first official reveal of the Gummi Ship and while the ship itself doesn't look much different, the spaces between worlds look to be bigger than ever. The big takeaway here is that the Gummi Ship sequences are running the gamut of environments. There's a sequence filled with space debris, there's one with spinning satellites around ice walls, an area with flowing lava, and a sandy environment with massive sand spheres that contain giant space worms. There seems to be a lot more detail going into the Gummi Ship stages, which seems to point to the need for deeper customization. What's not present is said customization. The Gummi Ship looks the same in all of these shots, which means any customization options are being kept under wraps. Gummi Ship customization hasn't always been the most user-friendly idea, so hopefully, Square Enix will have improved on the interface and the building options. Because it looks like players will need a strong ship to make it through some of these environments. 4. What Happened to Aqua? Hope everyone reading this has played Kingdom Hearts HD 2.8 Final Chapter Prologue. In particular, here's hoping everyone played the standalone Aqua story, because the events of that chapter look like they're going to be very important. In Sunday's trailer, King Mickey and Riku (now a Keyblade Master after passing the Mark of Mastery in Kingdom Hearts: Dream Drop Distance) look to be in the middle of the Realm of Darkness. They were likely there in search of the missing Aqua. Well, they certainly found her and she looks to be completely possessed by the forces of darkness. Aqua was one of the original Keyblade heroes from Kingdom Hearts: Birth By Sleep. She was among the first to face off against the evil Xehanort, a conflict that ended with her stuck in the Realm of Darkness. Aqua was essentially banished to a place of pure darkness, but after Ansem the Wise told her about Sora, Aqua had a renewed sense of hope, despite having wandered the darkness for 12 years. So what's changed since then? Well, Aqua has been trying to make her way towards the Castle of Dreams for years and KH 2.8 ended with her getting a good idea of how fix the collapsed bridge that led there. So did her plan fail? Or did she fall to the darkness along the way? Is the latter the reason why she told King Mickey that he's too late? Aqua and the other protagonists of Birth By Sleep are going to be major factors in the Kingdom Hearts III storylin and how the whole story ultimately ends. 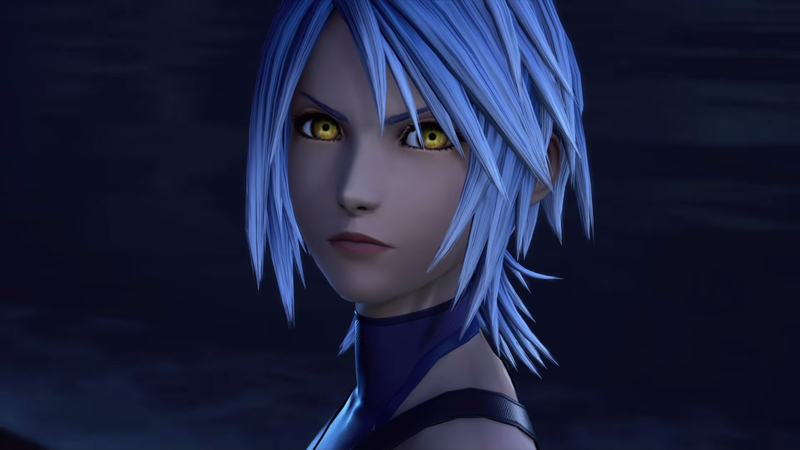 Being the strongest of her class, Aqua is a key character and if she's fallen to the darkness, it's going to be up to Riku to bring her out of it. Fortunately, he's had plenty of experience in this area over the years. Comes out February, huh? Boy I sure hope that's enough time for Square Japan to hire an audio engineer.